Congratulations to Ian Ingman, Assistant Coach, City of Liverpool SC, Swim Skills Squad on his appointment as Head Coach for the 2019 Swim England Lancashire County Training Camps which are being held in Accrington in April, .July and September. The COLSC website has lots of information covering many aspects of the Scheme and swimming in general. If you want specifics about facilities, council relationships, squad structure please use the link button to the right. This data and more can be found on the City of Liverpool Council tab to the left. The Swimming Squads are made up from the feeder clubs in the region. 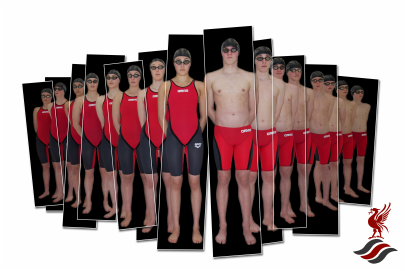 Many of our swimmers have developed and grown within the Liverpool area and have advanced to a different level. We are very proud of the fact that swimmers represent not only the City of Liverpool but also still train and compete with their local and often starter clubs! We are proud to see swimmers in the RED of COLSC but equally proud to see the BLUE, YELLOW, BLACK, PINK, WHITE of local swimming clubs. Together we are all stronger. The City of Liverpool Swimming Squad is very much aimed at getting the best out of every single swimmer that gets into a swimming pool. There are few swimmers that will achieve the highest standards but we feel every single swimmer should still be given the chance to achieve the very best of their own standard. There are thousands of talented swimmers in the UK and the North West Region is proud to have some of the very best of those swimmers. The City of Liverpool can provide a great deal towards the development of a swimmer but only the swimmer can provide the rest. Our hope is that we can provide an arena that allows each of our swimmers the time and desire to add their very own final ingredients.